Welcome to the Bad Wolf Costumes analysis of the Star Trek: Enterprise-era Starfleet undershirt and its corresponding sewing tutorial! 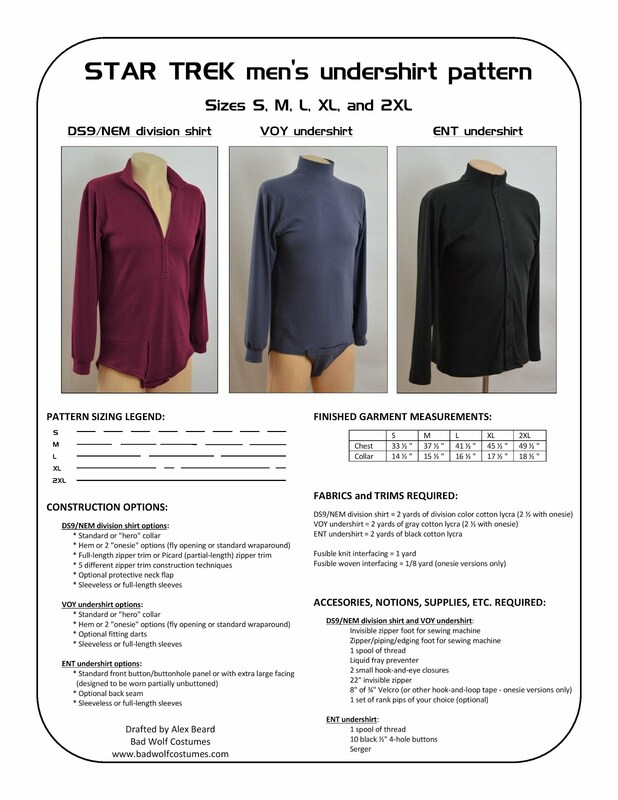 We primarily researched and analyzed the ENT undershirt for our men's sewing pattern, which is available for purchase from our Etsy shop, web site, and eBay store (see right), but we're happy to share our research and findings with you here, as well as the free sewing tutorial intended to accompany our pattern. A free downloadable PDF version of the unabridged analysis is available here on the Bad Wolf Costumes web site for your convenience. Lastly, we'd like to extend a special thank-you to Mike Paugh for photographing his screen-used Lieutenant Reed ENT undershirt, sharing those photos with us, and allowing us to use them here in our ENT undershirt analysis. Furthermore, we would like to thank both "Lynsioux" and Gerald Gurian (of the Star Trek Props, Costumes, and Auctions Authority) for photographing their screen-used Enterprise uniforms in detail and allowing us to use some of their photos for this uniform analysis. We'd also like to thank Michael Cowart (as always), the Starfleet 1701st for being a wealth of information and its board members for contributing, and TrekCore for its library of Enterprise publicity photos, behind-the-scenes photos, etc. So where can I buy two?